This is a versatile and subtle ride with a particularly clear stick response. As for the hats - they also fared well live since, although dry and not the most powerful cymbals, they seemed to occupy a frequency where they cut through without being raucous. An unexpected outcome and a welcome surprise. Distinctive, characterful and classy, occupying particular niches for discerning players. Hi-hats may be too dry and lacking in power for some styles. The K designation traditionally indicates a darker and warmer sound. These cymbals were developed in conjunction with Steve Gadd. 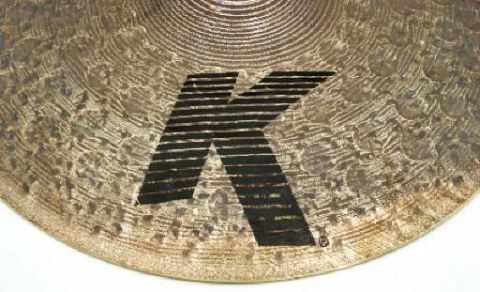 The K designation traditionally indicates a darker and warmer sound, not so brash and loud perhaps as Zildjian's As or Zs. K Custom cymbals are a 'contemporary expression' of the K sound, with drier but still complex sounds. The 20" K Custom Session ride is an unlathed, medium thin cymbal in a brilliant finish, featuring crater-like hammerings and a smooth bell. It's a larger version of the previous 18" ride, which was developed in conjunction with Zildjian's prize champion Steve Gadd. Gadd has often preferred an almost perversely dry cymbal sound, to the point he would play an old favourite cracked 18" ride. In his hands it worked, and the sound of that cracked cymbal became the inspiration for the 18" Custom Session ride. You'd expect then an extremely dry - virtually dead, even - cymbal, but that's not what we found. The cymbal was anything but dull. It was brighter and fuller than anticipated. But maybe that's the idea? After all, sitting behind a cymbal, you hear a different sound to the audience or what ends up on a finished record, where overtones are buried in the overall band sound. Maybe the audience hears a more Gadd-like sound than the player? What did remind us of Gadd was the wonderfully distinct stick sound. When the band is roaring away, you can still hear every ride stroke. This clarity extends to the quite raw and bright bell. Although the cymbal is designated 'session' we found it worked great live. In fact it would suit many different types of player, reﬂecting Gadd's legendary versatility. Although it is medium thin and sonically inspired by a cracked cymbal, it is neither too dark nor too dry. These are also an addition to a previously available model, the 14" Special Dry hats. In contrast to the Custom ride, the hats are rough looking with a dark brownish top, heavy lathing and pronounced circular crater hammerings. Also unlike the ride, the bell is lathed rather than smooth. The top cymbal is medium-thin and is paired with a slightly heavier, medium weight bottom. This time we found the sound too dry at first. In fact, our immediate reaction was the hats were so dry they lacked ﬂavour and warmth. But we soon realised they were sharp and crisp, suiting them to miking and recording. Being 13" they have a slightly higher pitch than standard 14" hats, but since they're relatively light they are also fairly dark in timbre. The thin-ish top cymbal means they don't sustain as much as heavier hi-hats when opened up. The result is a clean, short-ish wash and a concise pedalled 'chick'. The magic letter 'K' always bestows a mysterious quality and these latest cymbals are not quite what you'd expect. Regarding the 20" ride, it's hard to see how you can replicate the sound of a cracked cymbal except by cracking it.